…And then my luck ran out in October 2015. I became very sick. I started throwing up every time I tried to eat or drink anything, so I thought I had the stomach flu. Then my back started hurting. By this time I was already bedridden, and the vomiting had been going on for two days. I told myself that if it wasn’t better the next day, I would go to the doctor. Well, the next day it was worse. I decided to skip the doctor and go straight to the ER. It was a good thing I did because when I got there my blood pressure was 190 something over 90. The pain was so severe morphine didn’t even put a dent in it, so they gave me dilaudid instead. I was extremely dehydrated; my veins had shrunk and they had to call in a pediatric nurse with a pediatric needle to insert a port in the back of my hand in order to get fluids into me. They did a blood test, which showed that my BUN-to-creatinine ratio was elevated. Blood urea nitrogen (BUN) level is another indicator of kidney function. Urea is also a metabolic byproduct which can build up if kidney function is impaired. 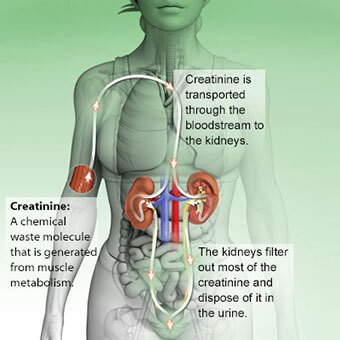 Normal creatinine levels for a healthy woman should be in the 0.5 to 1.1 range. My creatinine level was 7. 1. The urologist told me I was in renal failure (kidney failure). I didn’t even realize I had a kidney stone, I had ignored all the signs and attributed them to other issues. It turns out that I had not one, but two pea-sized kidney stones; one was in the ureter blocking the left kidney, and the other was in the ureter blocking the right kidney. In order to remove them, they would have to do surgery, but because I was still nauseous and dry-heaving, the surgery was postponed. By doctor’s orders, I was not allowed any liquids or food for three days. Talk about miserable. I didn’t care about the food, but I was extremely thirsty, and I had the worse case of cotton-mouth ever! During those three days, I began to suspect the dilaudid was actually causing the continued nausea and dry-heaving. When I told the nurse, they took me off that and started the morphine again, and I started feeling much better as the dilaudid wore off. Surgery for the Ureteroscopy and laser lithotripsy was finally scheduled for day three. The urologist had to go into each ureter with a small scope to laser each stone and was able to remove the pieces with basket extraction. I was given a lovely pair of stents that allowed my kidneys to drain. They were painful, let me tell you! They made me feel like I had the worst urinary tract infection you can imagine. I was sent home with a bag full of medication, including some mild painkillers. Two weeks later I had to go back to have those stents replaced with a new set of stents, which were then removed a week later. When the stones were sent off for testing, the results showed they were calcium stones. For the next couple of weeks, I did my best to drink the prescribed amount of water. The Nephrologist (kidney specialist) told me I had to drink enough fluids every day to fill two 2-liter soda bottles with urine. Can you believe that? The thought of drinking four liters of fluids a day was unpleasant, but having to drink enough for four liters of output a day was daunting. I also had stomach issues that caused terrible indigestion and reflux from the time I was discharged from the hospital. Tums to the rescue! I was eating Tums all day, but more so at night because of the reflux. I hate to admit it, but I didn’t read the directions for the recommended dosage, I was just popping them as I needed them. Well, guess what?!? You are only supposed to have 7 Tums Ultra in a 24 hour period. That’s it. OK, let’s just say I exceeded that number every day and suffered the consequences. Many people I talk to go over the recommended dosage when taking Tums. No one thinks about the side effects of taking too many because they seem harmless. Now you know, be smart, beware. Almost a month after my first trip to the ER, I got sick again, vomiting to the point of dry-heaving. So, I went to my doctor. I honestly thought I had food poisoning from a local tamale truck. I mean seriously, what are the chances of kidney stones and renal failure happening again, right?!? Apparently, if you’re me, chances are very good. I was in renal failure AGAIN! I ended up back in the ER, then the hospital for another four-day stay. In addition to nausea, I developed a migraine so severe it caused vertigo, which then caused vomiting. For four days, I laid in a darkened hospital room, trying not to move or open my eyes. I told my husband not to come visit with the kids because I was so sick, and I asked the nurses to put a do not disturb sign on my door. A CT Scan showed only one stone this time, which was sitting in the ureter blocking my left kidney. The urologist told me that this stone was too close to my kidney to laser it this time. In order to remove this stone, my urologist used shock wave lithotripsy. This is where shock waves from outside the body are targeted at the kidney stone causing it to break up into small enough pieces that will later pass naturally. The procedure worked, I didn’t have any problems. I had to have another stent inserted into the ureter to drain my kidney again, though. Yuck. Those things are miserable, you just can’t imagine. Anyway, this stent didn’t need to be in as long as last time, so it came out a week later. Indigestion and reflux were still an ongoing issue for me. After I got home from the hospital, I picked up the Tums bottle to take a few and saw that it contained calcium carbonate. Hmm… I started thinking about that, and then I started researching whether calcium carbonate caused kidney stones. Unfortunately, I did not find a definitive answer; some said yes, others said no. I stopped taking Tums just to be safe, though. Later, I did find a great article by Dr. Mercola that explained the different types of stones and how they are formed. According to the article, calcium supplements have actually been found to increase your risk of kidney stones by 20 percent. I’m sure that percentage increases when you are overdosing on Tums like I did. My suspicions were confirmed. I always have a bottle of lemon water near me so that I don’t forget to drink enough. Actually, my urologist told me to drink a gallon of water mixed with a fourth of a cup of lemon juice daily. According to him, lemon juice helps dissolve kidney stones. I can drink a gallon of water, easy-peasy. But honestly, I don’t think I have ever drunk enough for the four-liter output my nephrologist recommended. I avoid calcium supplements or anything with added calcium like the plague. I started taking magnesium supplements. Magnesium helps to prevent calcium from binding to oxalate. I prefer Natural Calm, raspberry lemon flavor. I add it to my lemon water and it’s quite tasty. When I have indigestion or reflux, I take the baking soda remedy instead of Tums. Dissolve 1/2 teaspoon of baking soda in four to six ounces of lukewarm water, drink it slowly and be prepared for some epic, nose-hair-burning belches. Added bonus – baking soda is sodium bicarbonate, which when taken with water, will reduce the acidity of urine and restore the ph balance in your kidneys thus dissolving uric acid stones and preventing future ones from forming. You can kill two birds with one stone when you take baking soda regularly. I also take Renavive when I get a stone. Renavive is an all natural kidney cleanse that helps to dissolve kidney stones. It works for me. I have been using it for about a year and a half now to help with passing stones. This is not a sponsored post, nor am I affiliated with Renavive in any way. I try to avoid high oxalate foods, as shown in the image below, from Osteoconnections. But I have to tell you, I’m not very good at avoiding potatoes, chocolate, and nuts. So, to make up for it, I add a little more lemon juice to my water to balance that out. It’s my personal justification for eating my favorite things, ha ha! How do you know if you have a kidney stone? Most of the time, there’s no doubt; other times, you may miss the signs or attribute them to other issues like I did. If you are experiencing any of the symptoms below, my advice for you is to see a doctor, preferably a urologist, right away. The most common symptom is the pain. For me, it’s a sharp stabbing pain that comes out of nowhere, causing me to gasp and break out in goosebumps. Some people experience a throbbing pain, or a pain similar to labor pains that hit you in waves. The pain is from the stone moving around. A lot of times you can track the progress of your kidney stone’s journey south as the pain follows the stone. Frequent and possibly painful urination. Sometimes the urgency doesn’t match the small amount of urine that comes out. Blood in the urine. You are probably not going to have blood floating in your pee, it won’t be that obvious. Although, if your case is severe, your urine may be a pinkish color (not a good sign – go to the doctor asap!). Otherwise, your urine will be cloudy, noticeably darker in color, and strong smelling. Vitamins and supplements can cause your urine to change colors, so take that into consideration, as well. Nausea, vomiting. If you have a stone that’s partially blocking your kidney’s output, the urine will start to back up into your kidneys and your body won’t be able to expel the wastes and toxins the way it’s meant to. So, your body will switch to its “Plan B” to try to expel those toxins by causing nausea and vomiting. Fever and chills. When your kidneys are blocked, even partially, bacteria can build up in your kidneys from the wastes and toxins that are not being expelled properly, which can lead to an infection. If the infection is not treated right away you will develop a fever and possibly chills. Nowadays, I am hyper-aware of my kidney health. I never want to go through all of that again. If you have ever suffered from a kidney stone you know there’s no magical cure to make it go away and never come back again. Instead, you just have to be vigilant in making smart choices and changes in your diet and lifestyle. My advice for anyone suffering from a kidney stone is to educate yourself and find a urologist who has been around for a while and has a lot of experience because they are the ones that can tell you which home remedies can help and which do not. And never ignore a kidney stone or kidney pain. Ever. Liked this post? You should ckeck out one of my post on Weekly Meal Planning 101!